Elite is still my love, but I think I've played more Dragon Quest Heroes II this week. Being able to boot up, beat up some monsters, then be done has suited this week well. This week was another "I can't seem to have energy and opportunity to game at the same time" kind of week. Barely touched my PS4. Mostly been grinding out earnable currency in Final Fantasy: Brave Exvius in effort to grab Dragon Quest collab units while they were there and now Sephiroth since he's just popped and is a focus unit for now. Also got going again on Fire Emblem: Heroes. Working on getting my crew into shape so I can start doing things again. Haven't played much since initial interest back at release, but the game has improved significantly since then. This past week has been super busy with being Mother's Day and all! Busy but with all good stuff! Still kickin Team Fortress 2 (my favorite game)! Other than Toj. Tuesday Nights - sometimes I'll hop on for only 30 minutes or so... just enough to get a round or two in. Squeeze in some playing time whenever I can. I was suckered back into playing Star Wars: Battlefront II. They fixed a couple broken heroes, added a couple maps, added new skins, and completely changed progression since I last played. Unfortunately, it is still a delicate balance of frustration and fun. . .
Also, still playing PUBG once a week with my brother. This week I had to put desk builder 2018 on hold and I'm playing "Help Mom clean out grandparent's house". I do hope to get back to eve in the near future. thankfully my son doesn't crawl yet XD and I work in a hip start up work space and sometimes my super dank basement. Played the demo for Chariot on the Switch. I liked it, but I get the sense that it was designed with co-op in mind and I doubt my older daughter would enjoy a platformer that gets difficult later on. It also started to drag on after 2 stages, so I doubt I'd enjoy playing through the entire game. Speaking of platformers, I've been enjoying Chibi Robo: Zip Lash on the 3DS. My Chibi Robo amiibo arrived on Thursday and I unboxed it and registered it last night. Thanks to @Zacharywathen97 for the game! I bought The Talos Principle earlier this week and I installed it. And that's it. :| Hoping to start it tonight. I have been playing SWG:Legends, which is a SWG post NGE emulator. It is the most full featured of any of the emulators that I have found and I have been having a blast with it. I have also been playing NBA2K on the PS4, the PC, and my Switch. And some Divinity 2 here and there. Started the second Palace in Persona 5. Short bursts of Chibi Robo: Zip Lash when I have the chance to get the 3DS out. Had a ton of fun playing Wii Sports bowling last night with my 2 daughters. My little one (who's 3 years old) got a spare without any help from me or her sister! My older daughter got her first strike as well. Good times! Still enjoying Chibi Robo: Zip Lash. Started The Talos Principle, but PC gaming time is hard to come by, so I'm only about 45-60 minutes in. Loving the game so far, though. Street Fighter 30th Anniversary Collection came out this week. I'd already pre-ordered and paid for it before the "well shoot, finances" hit, so I was pretty much stuck with it. Not complaining about playing it, though. Love being able to play Hyper Fighting and Alpha 3 online. So good. So very good. Haven't played much of my gacha games. Have dabbled in Rogue Legacy on Vita. That sweet sweet roguelite spin on Metroidvania is so good, and plays so well on Vita. And that's not enough Castlevania. Also been working on Bloodstained: Curse of the Moon over the last week. This is the 8-bit promo game for the upcoming Symphony of the Night spiritual successor. This one plays (and looks) more like one of the NES entries. It's excellently made. Challenging, but never even a little unfair. Great atmospheric design. This is retro homage done super well. Well worth getting. so.... trying to play some guild wars2 hots, but.... still confused and taking forever to level. other than that, some Overwatch here n there. been playing arcade for the lootboxes a bit. waiting for the season to pan out before hopping in. Its too volatile when the season begins and I usually get placed higher than what i did the previous season. My Husband bought a small used Arcade machine today. 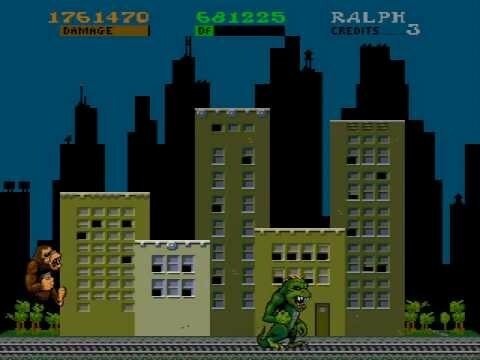 Played some good ole Rampage! The Good Old Days! Was gone much of last week, and have had to make up hours in the time surrounding because of that. Gaming has been a bit all over the place or off the map entirely depending on the day. When I have gamed, I've dabbled in fighting games, maintained my daily logins for my gachas, and played a couple of rounds of Everybody's Golf last night. And not much else this week. Got to play about 15 minutes of Team Fortress 2 during ToJ's weekly event last night. I want to get back to The Talos Principle, but it's unlikely I'll get any chunks of time for PC gaming between now and late June. Reviews for Curse of the Moon are almost universally positive, which leaves me very tempted to buy it on the Switch. other than that, some Overwatch here n there. been playing arcade for the lootboxes a bit. Overwatch, eh? When do you usually play? As long as you think "NES Castlevania, not SotN or later Metroidvania," you won't be disappointed. Weeks are finally getting back to some approximation of normal. Had a little more time for gaming the last few nights because of it. Finally started on Destiny 2's Curse of Osiris expansion. I guess it wasn't well received. I've always been interested in Osiris, so it's working for me. And got Battlefront 2 on super sale. Been playing and really enjoying the campaign for that. like 7am PST XD its magical.